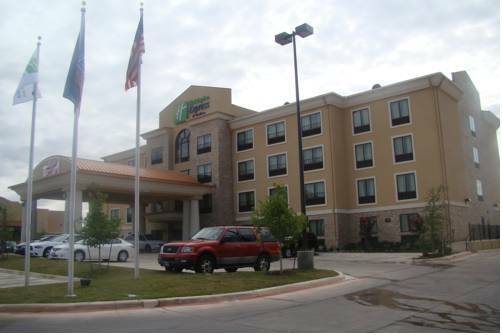 The Holiday Inn Express & Suites San Antonio NW near SeaWorld is centrally located between Six Flags Fiesta Texas & SeaWorld of San Antonio. We are the perfect place to call home whether relocating, attending a corporate event or visiting on leisure. With numerous restaurants close by, the hotel is just minutes from. Culebra Creek Soccer Park, National Shooting Complex, The Alamo, Downtown Riverwalk, and the San Antonio Zoo.Located on the northwest side of San Antonio, our central location provides excellent access to Valero, Wachovia, QVC Network, Chase operations Center & Christus Santa Rosa Hospital and many Oil, Energy, Gas and Trenching companies. We are just minutes from Lackland Air Force Base, University of Texas San Antonio (UTSA) and the NW Vista College. Families & business travelers alike will enjoy our Holiday Inn Express & Suites San Antonio NW near SeaWorld, where comfort is our first priority. Relax & unwind in contemporary guest rooms or spacious suites. Everything is better in Texas, & our hotel boasts some of the best amenities in the area. We are proud to provide business amenities, which include free wired & wireless HSIA, a business center, and our 24 hr convenience store. We encourage you to take the plunge in our outdoor pool & whirlpool, work up in our exercise room, & enjoy our complimentary Express Start hot breakfast buffet. Book your reservations now. Various department, food courts and fine restaurants, outdoor shopping, spacious parking lot with valet services, surrounded my beautiful surrounding, golf course and Fiesta Texas. From Shamu to dolphins, sharks, seals, sea lions, and much more, SeaWorld San Antonio is the world's largest marine life park. Six Flags Fiesta Texas is a 200 acre park featuring awesome rides, great shows, and incredible attractions plus White Water Bay Waterpark.